It's 11 more days till the 54th Tevis Cup Endurance Ride: 100 Miles - One Day. 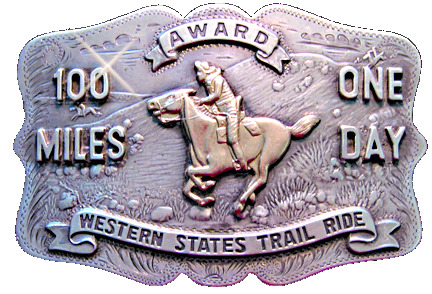 First held in 1955 by Wendell Robie, who set out to prove that any modern-day horse could cover the rugged 100-mile trail from near Truckee, California to Auburn, California in a single day, it has become an institution in the US. It's a ride against which all other endurance rides are measured; it was the inspiration behind the 100-mile Tom Quilty in Australia. The trail cuts through the heart of the rugged Sierra Nevada mountains, following part of a historic route of the Placer County Emigrant Road built in 1855, passing through the Granite Chief Wilderness area, passing historic mines and old toll trails, and crossing the American River. The ride is not for the faint of heart. It is hot, dusty, exhausting: there is approximately 19,000 feet of climbing and 22,000 feet of descending in the ride. There are steep rocky trails to traverse, cliffs to fall off, and the heat can be staggering. If you start, you have only a little better than 50% chance of finishing. although that is just a reminder of the incredible experience that you and your horse have accomplished. There are 177 entries so far. It begins at 5:15 AM on August 1st.